The barb is most often the trouble-spot in a hook. Most are cut too deep (stand out too far from the body), which causes weakness at that point. This, coupled with the common fault of the barb being set too far from the point, means that undue force is required to drive home both point and barb, sometimes causing the line to break. If the strike is less forceful, a hook of this sort will not fully penetrate the fish’s skin, particularly if it is a hard-boned and tough-skinned species like the pike, perch or barbel. A big, deeply-cut barb may look effective but is not. The eyes on eyed hooks should be examined. 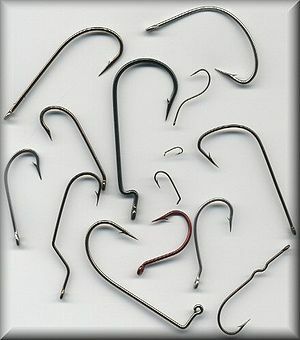 The size of the eye will depend on the gauge of the hook but always try to pick one which will just take the thickness of the line you intend to use — there is no point in having a gaping, obtrusive eye which causes the hook to hang from the line at an odd angle. 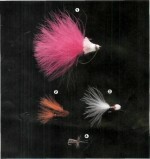 The length of the shank is important where some baits are concerned. For crust, paste, lobworms and sweetcorn a long shank is best; for maggots a short one. For casters, the variety with a long shank, known as a ‘caster hook’, is favoured. It should be remembered, however, that the longer the shank relative to the eye, the smaller will be the angle of pene­tration. This means that the hook will penetrate more easily but to a lesser depth. With short-shanked hooks it takes a stronger strike but the hook will drive home deeper. Hooks to nylon should always be treated with caution. First, see whether the whipping reaches the top of the shank. 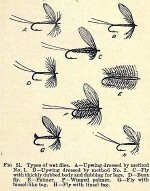 On some hooks it is too short, thus causing the hook to turn over when making contact with a fish and preventing proper penetration. Make sure that there is sufficient varnish on the whipping, as if there is too little the whipping may fall apart (eyed and spade end hooks do not require varnished whipping). Check the loop at the end of the trace. If it is not straight it has been tied badly and may be unreliable.